Any item in the ArmStreet online shop can be related to an iceberg: you see the nice high quality product, either ready to be shipped to you from stock or to be custom made according to your measurements and preferences. So what is hidden underwater? In a nutshell – the idea, sketches, historical research, investigation of related arts and sources, samples, fitting checks, multiple improvements of samples, photo shoots, development of patterns and technical descriptions, manufacture debugging, test drives, and catalog descriptions. So what drives us to get through all of those layers to the finished product on the surface? In short, a team compelled by curiosity and inspiration. The general concept of ArmStreet is to let our creative talent explore and invent without any limitation. High quality is key, aesthetic sense is a must, and customer's satisfaction is vital. Historical correspondence, though? Not so much. 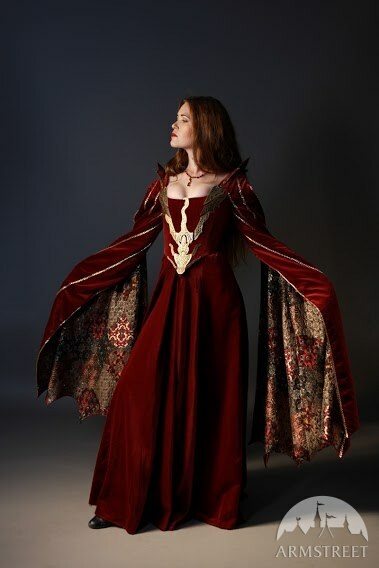 This allows us to spread our wings and deliver unusual, astonishing products, inspired by Middle Ages and Fantasy worlds. 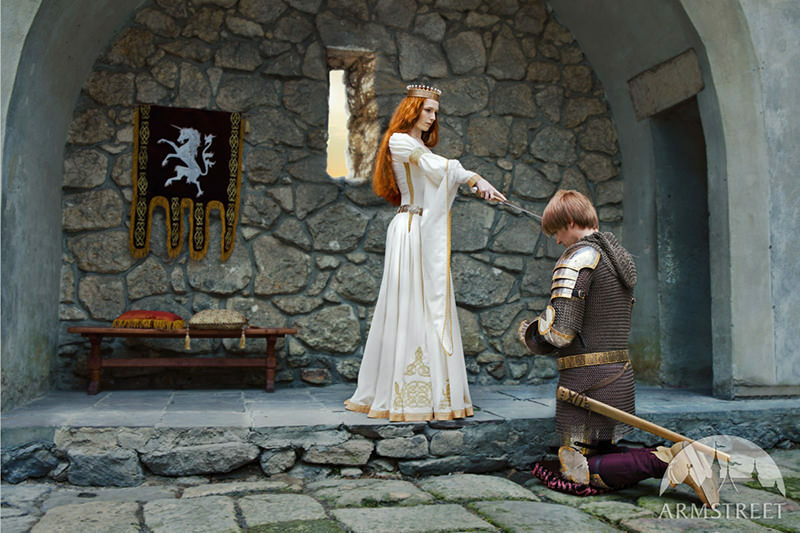 Our best-selling wedding dress is a stunning velvet gown inspired by the “Accolade”, a famous painting by Edmund Leighton created in 1901. Before appearing on our site, the themed collection passed all the stages of production, from research to manufacture,and in passing deepened the knowledge about the Pre-Raphaelites Brotherhood for everyone involved. Inspiration and curiosity, right? Those two aspects — curiosity and inspiration — can lead us to delightfully unexpected places. 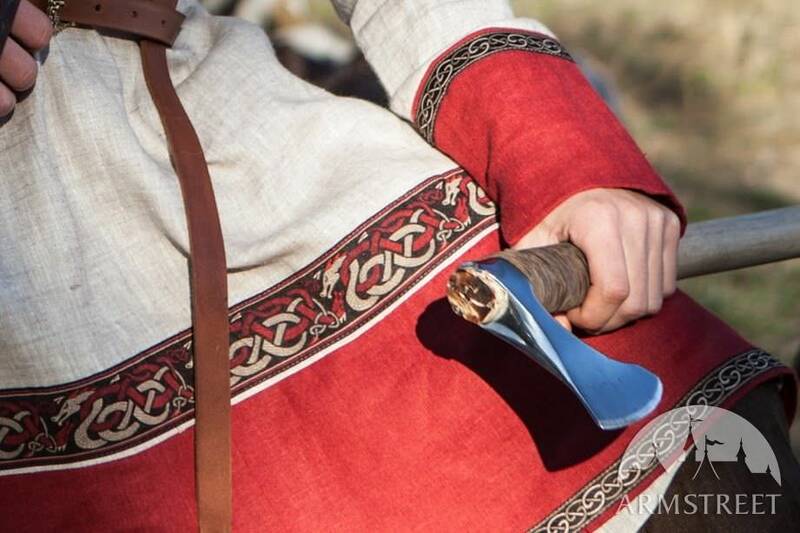 We can look to our viking collection, which was intended to be “a couple of simple tunics”, but resulted in almost a hundred items, including armour, decorative weapons, shoes, men’s and women’s costumes and even a tent! 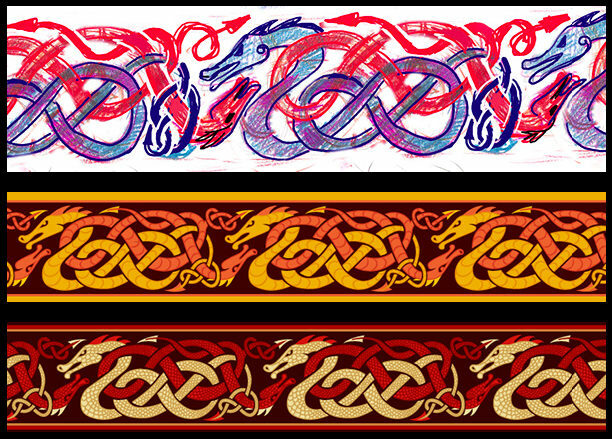 Our viking series is also an excellent example of our research approach: ArmStreet’s then head of our design department Daria Andrieieva aggregated information about snake motifs she discovered while working on the patterns for trims and etching into the deep and interesting article: The Snake Motif in Viking Art: 10­th – 12th Centuries. Okay, so the actual sample is produced and the photos are shot, are we there yet? Not quite. Before appearing at our store, every new item receives it’s own set of patterns for all the regular sizes and a detailed description of all the decorations, fittings and nuances of the manufacturing process. Moreover, if the item is fit for bespoke tailoring, the rules are developed for this type of production as well. Now the new something by ArmStreet is ready to see the world and bring it some joy. A real masterpiece! There are no words to describe how excited we are to create art and have a part in your dreams coming true. We want to be proud of what you get under the ArmStreet label. That’s why we reject all the requests for copies of costumes from movies and tv series. We respect people working hard on creating those amazing characters and do not want to prey on their labor and imagination. Our talented development department headed by an imaginative art-director is working permanently on the creation of new items: from precise historical replicas to complete stretches of the imagination, you can be sure to receive distinctive, high quality handiwork. Is it the first time you are wandering through our online store? Come in, have a look at our collections — they will provide you the most inclusive insight into the stunning world of ArmStreet.